With Scottish national identity playing a key role in the political landscape of the British Isles, notions of “Scottishness” are now under scrutiny like never before. The culture of Scotland before the Act of Union of 1707 and how Scotland represented herself in literary terms, however, is often overlooked in these arguments. 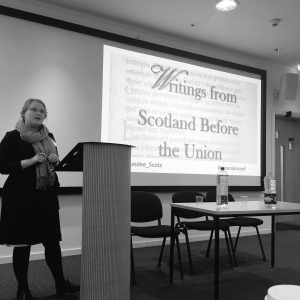 Hosted by Dundee’s Centre for Scottish Culture, Writings from Scotland Before the Union was a one-day conference that examined the literary environment of Scotland prior to the Act of Union of 1707, with the objective of gaining a clearer, more rounded understanding of how Scotland saw herself in literary terms before formal Union. Papers on the day ranged in theme and tone, beginning with Dr Annette Hagan’s (National Library of Scotland) overview of the written languages of Scotland before analyses of poems such as Roland Furious by John Stewart of Baldynneis, and a highly entertaining and engaging piece on The Wife of Auchtermuchty delivered by Lucy Hinnie of the University of Edinburgh. The day was rounded off by a fascinating Keynote address by Dr Kylie Murray of the University of Cambridge, and the Centre would like to take this opportunity to express our deepest thanks to Dr Murray. Her address focused upon the work of Elizabeth Melville, Lady Culross and was furnished with a dazzling array of primary source material and expert knowledge. We thank all of our speakers for their excellent papers, and our delegates for their insightful questions, and look forward to welcoming them back to Dundee in the future! Indeed, we hope this conference will be the first of a whole new series.